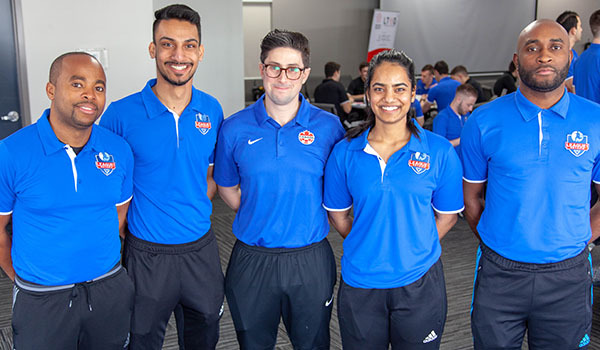 With the formation of another high-level soccer league in Ontario, the opportunity for good young referees to aspire to higher levels became available to all Districts. The following referees from Scarborough have met the standards required to be invited to the Elite Camp on April 5th 2019. Congratulations to Fabrizio Stasolla, Kuizan Weekes, Jerome Watts, Roshan Mendonca and Divya Mendonca who were invited to attend this Elite Camp. Scarborough is very proud of our referees, especially when they are involved in high- level leagues and camps. Fabrizio and Kuizan have already established themselves as National and Provincial Referees. Jerome, Roshan and Divya are District 8 and 7 referees, they are now embarking on the same journey as Fabrizio and Kuizan, to be the best they can be. (Roshan and Divya are brother and sister). Great job guys! Your District is extremly proud of you and we wish you all great success on the field.